It might feel like it’s too early to think about NEXT school year – you’re just getting settled into THIS year, after all! But for the second year, the Free Application for Federal Student Aid is open on October 1st. 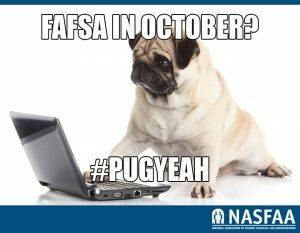 Because the FAFSA now uses income information from two years ago, most people will be able to finish their FAFSA this fall. Depending on your home state, there could be a benefit to filing early. Dickinson’s deadline is May 1st, but why not get it out of the way? Pro Tip: Most students will be able to use the IRS Data Retrieval Tool to make the FAFSA a breeze.